In order to fully release the child potential, you have to introduce him step by step in more and more demanding tasks, in order to make this form of education, his interest. Then you might sleep well and the child is going to search for education connected with multiplication table by himself. Furthermore it is going to give him satisfaction and joy. An example of this might be a moving from "phase of items" to "cutting the lines", based on which the child will start to understand the multiplication table. Luckily, there are a few easy methods in the form of a game, thanks to which our youngest ones will be able to memorize with smile, the moment in which they had to deal with the curse called multiplication table online. 1. For first game we need only hands and a few speels for example "Abra kadabra, hocus-pocus - nine multiply". The method is piece of cake - it is connected with multiplying 9. Example 1: 5x9 = ??? First you have to rise your both hands. Then, stating from the left side you have to count your fingers up to 5. In this case it is the thumb of the left hand. Then you have to bend it. Thanks to this, you have on your left hand the number of tens - 4. On the right hand you have the number of one - Five in this case - 5. Then we combine both numbers. Here, the second finger in the left hand is the ring finger - remember that the method works only if inner sides of your both hands are direct down - you have to see your fingernails. Now you have to bend your finger and you get 1. Then we have to count fingers which are left - the ones which are after the bend finger. It is 8, right? We write down both numbers next to each other and we get the result. And so long and so forth up to 10. You should have 10 operations. Remember, that players have to write down their name on the top of the paper. Then each player is throwing the dice and then the number of spots is put under the next operation. Then he counts the result. The number of turns equals to number of operations - 10. Just take a look what might happend in 9th turn. Example 2: The player throws 6. Then he puts it under the 9th operation. The result equals - 54. After the last player, the results are added to each other. The person with the highest score, wins. 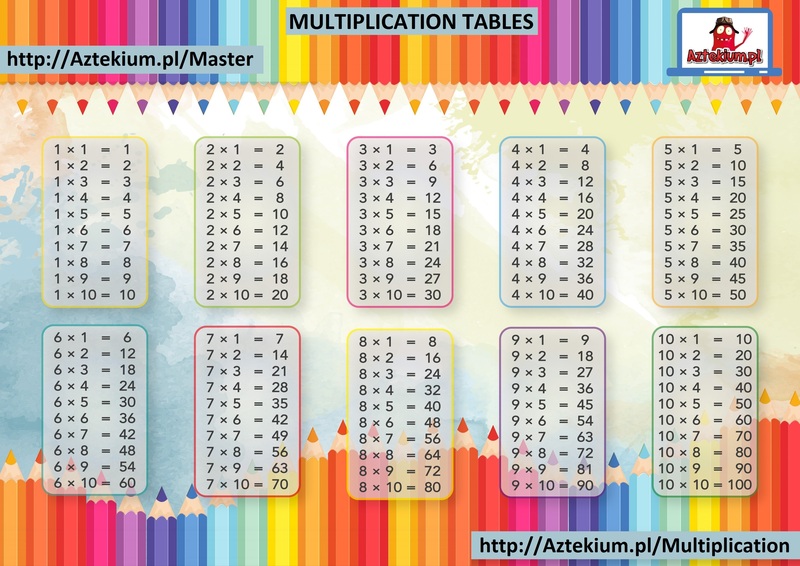 It is a great fun, thanks to which you are able to memorize, how does the multiplication table works up to 100. 3. For the next game - for a small artists which like the handmade work. You are going to need as big amount of colorful material as possible, drawing pins and cutout. You have to attach the material to the wall - in visible spot. Then you have to cutout numbers in various shapes and colors. For example: Green, Red, Blue, Yellow, Orange. And so long and so forth - use your favourite colors and use the rule of the first association. Then you have to attach with the drawing pins in the form of operations and then calculate the results. You have to attach them to. Looking on these operations and associating them with various colors is not only a wonderful game. 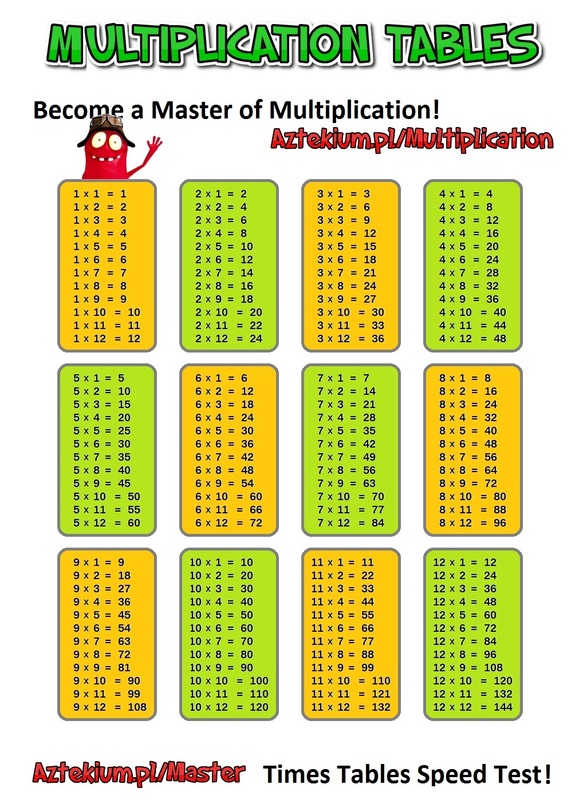 It is also an interesting and creative way for memorizing the multiplication table. When we multiply two numbers it is not important which one is the first and which one is the second. The answer is always the same.. In fact, a half of the table is the mirror reflection of the second half. You don't have to remember that "3 × 5" i "5 × 3" you just have to remember that "3 a 5 to 15". It is hard to remember whole multiplication table at the same time. Thus you should learn it in parts. C Is the same as B, only other way round. Worth to learn. D Finally, learn the fragment from "6 × 6 to 9 × 9"
Then make everything together, training the whole "system of the multiplication table"
2 × 2 = 4, 2 × 3 = 6, 2 × 4 = 8, etc. For example: in order to multiply 9 by 8: hide your eight finger and then you can count "7" and "2"... the answer is 72. 10 × is the easiest one, zero is always at the end 0. 10 × 2 = 20, 10 × 3 = 30, 10 × 4 = 40, etc. It seems that the hardest ones are 6 × 7 = 42, 6 × 8 = 48 i 7 × 8 = 56. Very often we tend to repeat "six sevens equals fourty two ", "six eights equals fourty eight". What about duodecimal multiplication system? 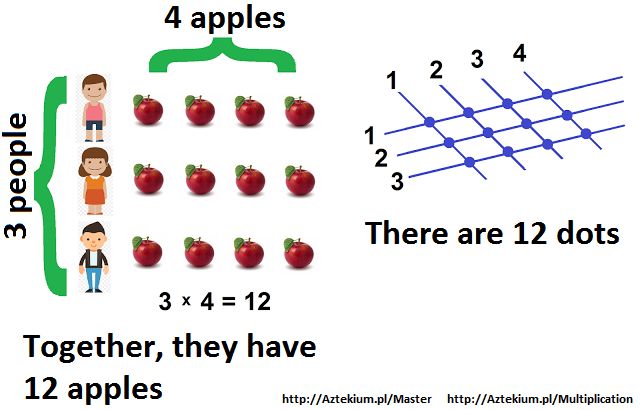 First of all, 11 × is usually easy: from 11 × 2 to 11 × 9 you have to add two numbers to each other. 11 × 2 = 22, 11 x 3 = 33, ..., 11 x 9 = 99. It is important to not to push child to much. He does not need to constantly spend time with multiplication table. A typical swotting is not going to give much. Furthermore, a typical memorizing way of learning is going to be problematic in the future. In the moment of stress the child my forget the most basic operations and results, which might end with bad score during the test. There are many forms of playing, thus it is worth to focus on your own creativity. After all, sitting and repeating is dull for both child and parent. If we do not have time, or even worse patience, we can always use the virtual world - to some extent. 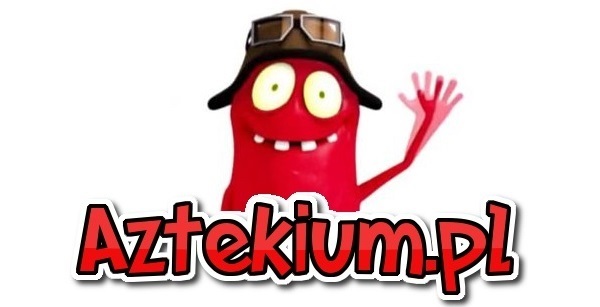 Online we can find many programs and sites which offers a nice combination of pleasant and useful. 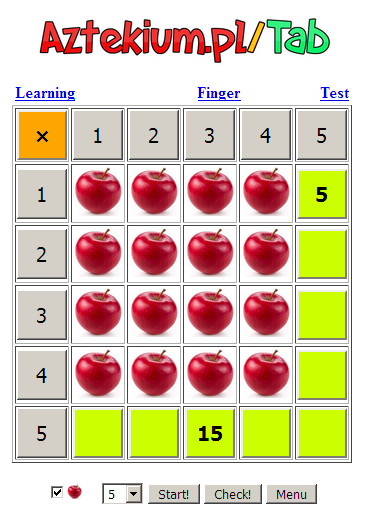 Learning multiplication in form of a game, is developing the imagination and creativity of a child. It might be also the first step towards IT, which is connected with mathematics. 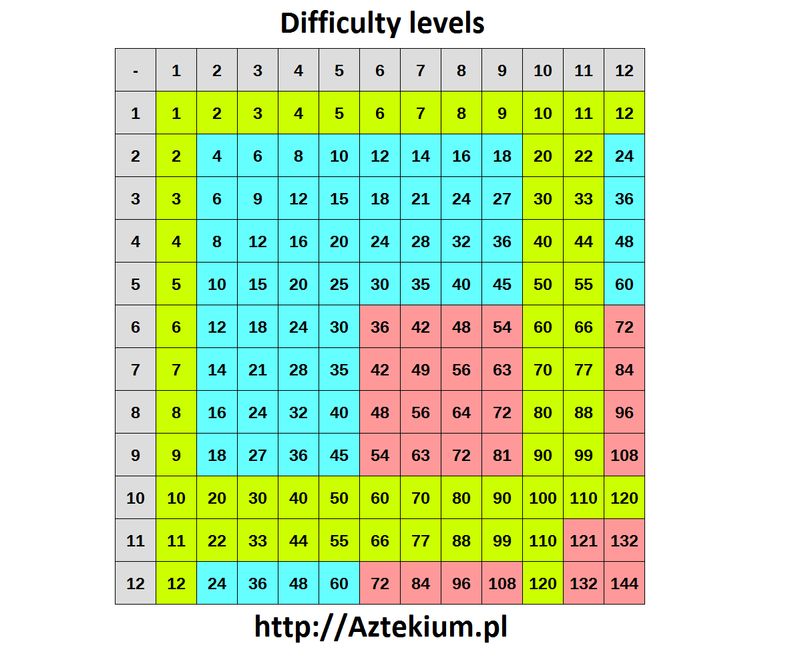 An example might be a site http://Aztekium.pl/Multiplication, which in an interesting way shows how pleasant can the learning of the multiplication table might be. The site has a ranking in which children might compete with themselves and increase their arithmetic knowledge. 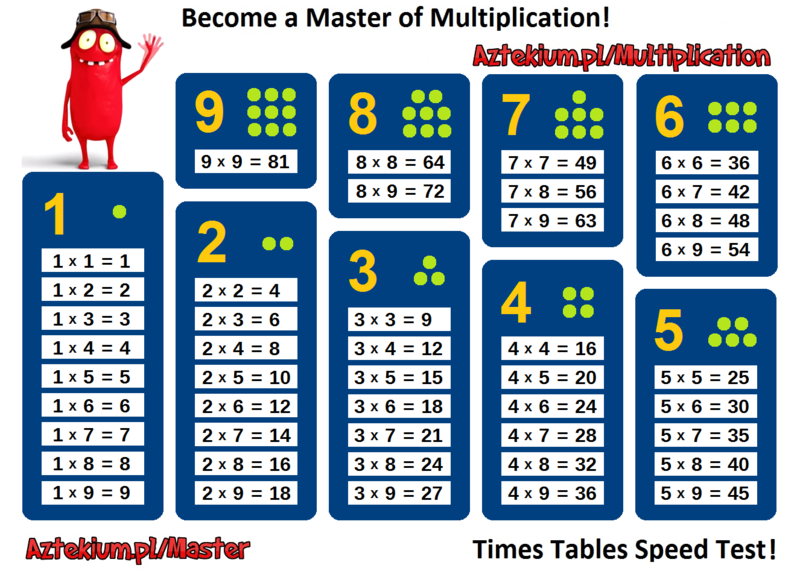 What about time trial multiplication table? 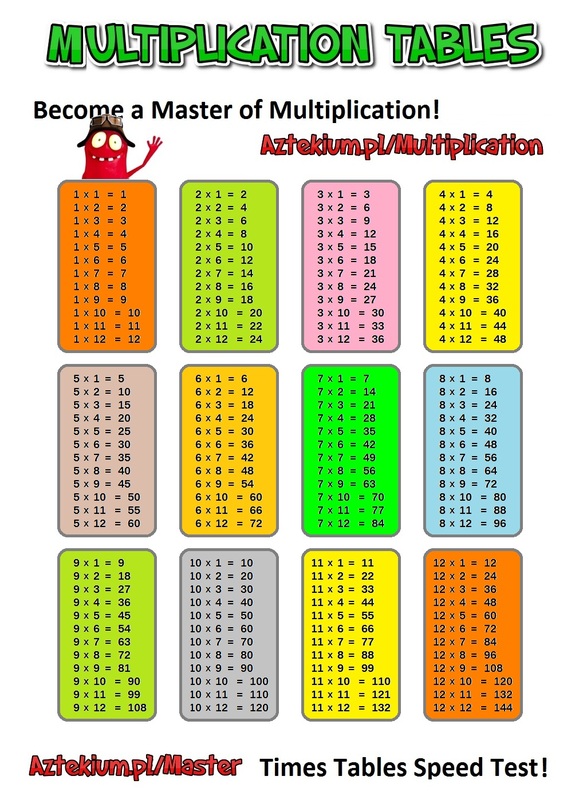 For people who like to deal with their own weaknesses there is a special test called Master of Multiplication Table. Such type of playing together with developing the knowledge is going to bring expected effects. 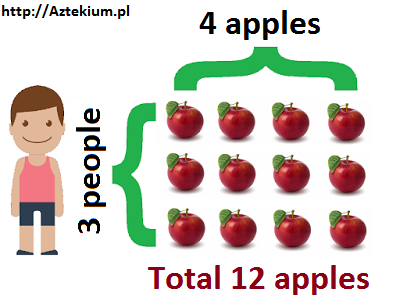 In polish schools, one of the main problems is lack of individual approach. It is especially important in the earlier phase of education. A lack of attention my change the approach of the child to the education in a negative way, furthermore they might influence badly the mentality of the child and change the education into a sad duty.